It couldn’t come soon enough: On Thursday, Year One students finally set out on their highly anticipated trip into San Francisco. While Year Two students stayed on campus and polished their personal projects, Year One campers strapped on their backpacks and headed for the city. 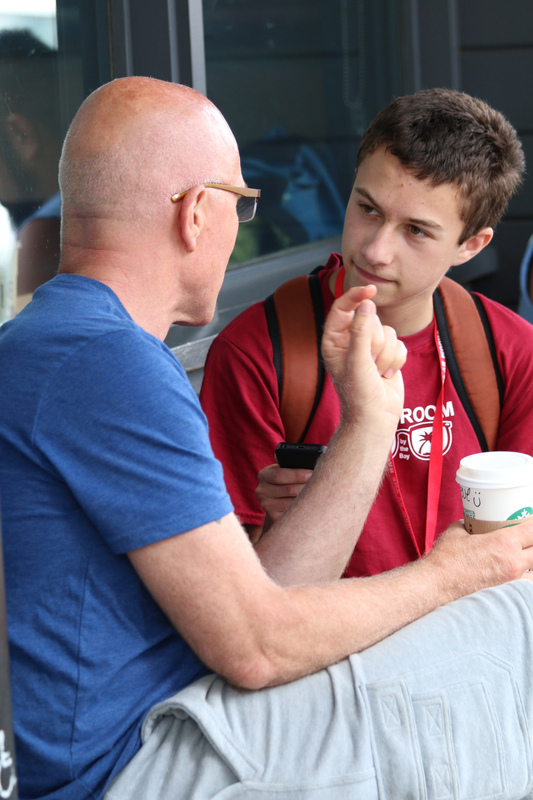 NBTB 2015 student Calder Stenn, at right, interviews an unidentified man in San Francisco during the Y1 field trip. Although several students had never stepped foot in San Francisco before, they did not get the typical tourist views that a newcomer may expect. Groups spread all over the city, each crawling through areas that they felt would contribute the most substance to their reporting endeavors. Teams covered various demographics, traveling everywhere from the classic AT&T Ballpark to the city’s famous LGBT neighborhood, the Castro. Needless to say, the day was jam-packed and required bountiful energy levels. Yet, at 7 p.m. some still chose to make a stop at a keynote presentation from Scott Landis about his work at Storycode and at the University of Oregon’s OR Magazine. Aili David, a Year Two student, paid a visit to the keynote to gather more information on the various fields of journalism, and was fascinated by the work that Landis was able to accomplish through software.